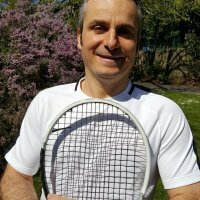 Fabiano is an enthusiastic and passionate Tennis coach with 10 years of experience. As a junior competing in Brazil, Fabiano won many tournaments and now as an adult continues to compete at club level. Since choosing to coach tennis he has never looked back and continues to love teaching this amazing sport. Currently Fabiano is an LTA Level 3 accredited coach and is committed to developing tennis in the Bournemouth area. Aspiring to bring more players to the sport and helping them to improve their tennis skills.